Roasted chicken dinner with fennel and cayenne pepper. Rub the chicken down with the olive oil. 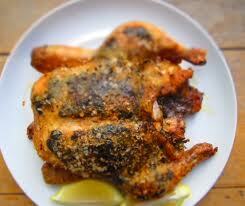 Combine the salt, fennel, pepper, Italian seasoning in a bowl and sprinkle over the top of the chicken. Place the lemon pieces and bunch of thyme inside the chicken. Bake in the oven for 1 hour 15 minutes. Remove the string and serve!